An anecdotal history of New York City street art. Several years ago, my evenings were shaped by a clandestine ritual. After dinner had been eaten and the dishes washed, I would load a backpack with cans of fluorescent Krylon and bike to the areas of New York City that hum with activity during the day and grow languid or deserted at night: the Manhattan Bridge, the Gowanus Canal, the Chelsea gallery district. I was making graffiti that recontextualized the slogans and statistics of popular advertising campaigns (iPod or the Atkins Diet were two notorious ones then) and shoved them back in the face of consumers. I was producing other, different work, too–objects that fell under more accepted definitions of “art”–but nothing that felt as alive as a public hit. Ceding control over one’s audience was thrilling. Having an audience was thrilling. I often thought about whether it would be possible to show graffiti work in a conventional art space, and I never hit on a solution. Putting graffiti in a gallery robs it of an environmental scale and implies that its appeal is aesthetic instead of social. The point holds for all street art: not only dogmatic public works, like Raymond Hains and Jacques Villegle’s décollage posters in early ’60s Paris, but also the graffiti done mostly for an audience of peers, like the work of the New York City “bombers” documented in the early ’80s films Wild Style and Style Wars. Each film catalogs the thrill of bombing in an era when, as the city’s social fabric was dissolving, the art of the underclass became most visible. Big Apple rappers were breaking nationally, break dancing was their physical rejoinder and “wild style” graffiti–blasting with color, armored with arrows and flourishes that made it illegible to untrained eyes–their visual analogue. The lineage of graffiti, break dancing and hip-hop is largely traceable to one section of one borough: the desperately poor, arson-razed South Bronx of the ’70s and early ’80s, a locale documented by Lisa Kahane in her new book of photographs Do Not Give Way to Evil (powerHouse Books, $35). If Jamel Shabazz is the humanist photographer of the people from this era of pre-Bloomberg New York, Kahane has the same sensitivity for landscape. 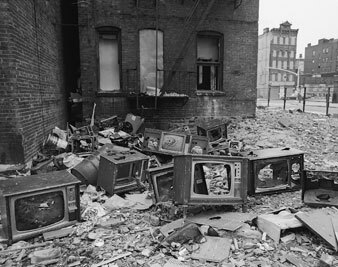 The South Bronx became known as the place where the family and consumer values of the ’50s met a violent end, one conveyed by Kahane’s image of smashed television sets amid a rubble-strewn field engulfing a boarded-up tenement building. As Kahane writes in a brief essay, arson became the best liquidation strategy for landlords sitting on worthless property. She notes that the Bronx averaged 12,000 fires a year in the ’70s–more than thirty every day–a phenomenon grimly captured by a photograph of a forlorn lot filled only by the junked roof of a house. Look past the garbage, over the trains, under the ruins, through the remains, around the crime and pollution, and tell me where do I fit in? South Bronx, New York: that’s where I dwell. To a lot of people it’s a living hell full of frustration and poverty, but wait: that’s not how it looks to me. It’s a challenge, an opportunity, to rise above the state of debris. Thunderbird Immolation used a site of art-world power to stage a confusing scene of dispossession and drunkenness (although Pope.L drank nothing during the performance), a blatant reference to white fears of black urban crime during an era when the number of black men going to prison was climbing every year. Pope.L’s most notorious series of performances is probably Great White Way, in which his goal is to crawl (painfully slowly, and wearing a Superman suit with a skateboard strapped to his back) from the southernmost point of Broadway to the northern termination of the avenue in Inwood. His most incendiary, however, may have been the 1991 piece Tompkins Square Crawl, where the friction generated by Pope.L crawling the streets of New York’s East Village in a business suit caused another (black) man to angrily confront the (white) cameraman documenting the performance. Like graffiti, some of Pope.L’s performances have the potential to snag viewers at their most vulnerable, during those crucial few moments before they realize that what they’re witnessing is “art.” In that light, it seems that the ubiquitous cameraperson documenting Tompkins Square Crawl and other Pope.L performances undermines this frisson. The Bronx Museum’s current exhibition “Street Art Street Life” runs an identical risk: deadening the effect of art meant either to be ephemeral, subject to unauthorized alteration or confrontational. The show operates under a very loose definition of “street” that ultimately seems inclusive of anything urban and outside: Ed Ruscha’s photography book Every Building on Sunset Strip; Shabazz’s photos; documentation of Taiwanese performance artist Tehching Hsieh’s remarkably extreme One Year Performance, where the artist spent an entire calendar year (excluding a brief incarceration) in New York City without entering a building. But despite the inclusion of Hsieh’s hard-core performances, “Street Art Street Life” never transcends the museum. In both Wild Style and Style Wars, the existential conundrum that sends the graffiti crews atwitter is the sudden possibility of their work’s commodification in the face of a booming visual art market. Some went for it, but despite a 2006 Brooklyn Museum exhibition (“Graffiti”) insisting the contrary, it never quite caught on. Excising street art from the street neuters the gesture. Divorced from its context as a scourge or an implicit resistance to the status quo, it’s usually left to accept a status as an object for polite contemplation. On election night, I watched the returns on television at a rented facility functioning as a makeshift bar at the corner of Park and Washington in Crown Heights. When CNN called Ohio for Obama, ensuring his victory, the crowd burst into busy Washington Avenue, flooding the streets and choking off car traffic. The owner of a nearby African drum shop played his wares as the crowd danced, cheered and slapped hands with newcomers forced to park their cars amid the manic throng. It was a spontaneous outburst of total joy, among the most empowering things I’ve ever been a part of. It felt like the epitome of street art: intoxicatingly ephemeral and fundamentally positive. My favorite photo in Do Not Give Way to Evil shows a group of kids picking pink, red and white flowers from a comically incongruous field along Charlotte Street in the Bronx, project buildings and burned-out towers glowering in the background. From the darkest mire can be gleaned the opportunity to rise above the state of debris.